BANGI, 10 Dec 2012 – Digital media once considered the alternative has now become mainstream overtaking the mainstream media which has become a dinosaur. 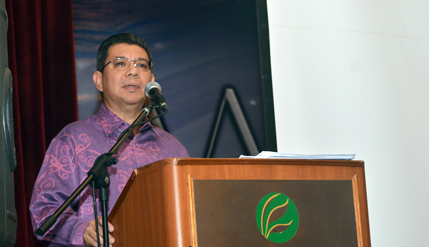 Deputy Minister of Higher Education, Dato’ Saifuddin Abdullah said digital media has usurped that role in the wake of the gigantic strides in ICT which have impacted the way information is disseminated in the country. He was speaking when officiating the Perdana Mention Night 2012 organised by the School of Media and Communication Studies, Faculty of Social Sciences and Humanities of The National University of Malaysia (UKM) and its students here last night. He said digital media was once considered the alternative media but has now progressed into becoming the mainstream usurping the traditional role of mainstream media which has now become a dinosaur. As such students needed to adapt to the new environment to enable them to enter the new field without much problems, he said. Dato’ Saifuddin reminded the students that academic life is different from working life and they have to adapt with their new surroundings. 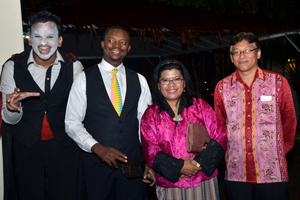 The annual dinner was organised to entertain final year students who would be finishing their studies soon. 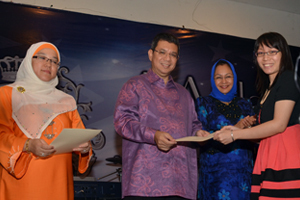 Dato’ Saifuddin presented awards to those who excelled in their fields. Deputy Secretary General of the Ministry of Information, Communication and Culture, Dato’ Rothiah Omar; Dean Faculty of Social Sciences and Humanities, Prof Hazita Azman; Director of Perkasa Remaja, Prof Samsudin Rahim; Director of Corporate Communications Centre, Prof Mohd Safar Hasim; Deputy Director of Securities and Public Order, Datuk Ameer Awal and Chairman of the School of Media and Communication Studies, Dr Normah Mustaffa attended the function.